José García Escobar (JGE): From the outside it seems that Nicaragua is stuck between repression and revolution. Is this correct? What’s a day like in Managua? Is there still hope? Gioconda Belli (GB): I like your description because that’s exactly how it feels. On the one hand, there’s this great energy coming from the people. For over four months people have tested the strength of their convictions, and have also shared the discontent. You can feel that there’s collective energy, mainly in the protests. In that sense, there is, like you say, a revolution and yes, there is hope as well. There is always hope. Whenever you think of tyrants, such as Daniel Ortega, one must remember that their time will eventually come. And when it comes to repression, it has been brutal. Managua is deserted after sundown, and this is caused by the presence of a group of armed, hooded men who patrol the city looking for dissidents. It’s like Ortega has formed a Praetorian guard with agents that capture and kill with complete impunity. Currently, in Nicaragua, we’re victims of constant Human Rights violations. JGE: Have you found that there are similarities between the Sandinista Revolution and the actual resistance and social movement against Ortega’s government? GB: In the seventies when Somoza was still in power, the resistance pushed in a different way since it was an armed movement. It was fighting against a relentless dictator that had a brutal army fighting out on the streets. Now we’re talking about an unarmed movement also fighting a ruthless and brutal dictator. And being unarmed plays a significant role in current events. We have seen terrible images coming from Masaya and Monimbó where people are fighting the army using slingshots. Slingshots versus firearms. David versus Goliath. The circumstances are similar, but people have responded with no firepower. We can also see Daniel Ortega and Rosario Murillo’s desperation now that they have started saying that American forces sponsor the protests, which is an easy thing to say since Nicaragua has long been a victim of American policies. For example, the CIA supported the counterrevolution along with what was left of Somoza’s army. But now we’re talking about a popular uprising against an absolutist government that has left us without alternatives, much like Somoza did. JGE: Are young people still the main engine of Nicaragua’s social movements, much like they were in the seventies and eighties? GB: Yes, they are the primary engine again. The April 18th march, which was brutally repressed by the army, was a march formed and pushed by young men and women. Luckily we now have media and technology available to document this repression. Other young people have joined the protests since. Students, kids. Many have been killed, sadly. The protagonists and victims of this social movement are young people. JGE: Do you see a type of collective memory based on the revolution in these young men and women that are out in the streets everyday since mid-April? GB: It’s fascinating how, for example, they’re not particularly organized. It seems that there is a type of ghost flying nearby, a ghost that serves as the historical memory and makes people know how to come together, or how to build a barricade. This new rebellion has been a spontaneous movement, organized by the social memory we, as Nicaraguans, have after fighting another dictatorship. A few months ago I wrote a poem called Relevo, in which I say exactly that, that the youth carry the fire and the rejection against tyrants in their blood. JGE: What place does feminism have in Nicaragua today? What role has it had in this year’s social movements? GB: Nicaragua’s feminism is active and well organized. It also remains close to other popular movements. Nicaragua’s feminism not only fights for its own causes but for popular causes as well. There cannot be a separation between feminist causes and the ones from the less fortunate. Nicaragua, for example, has a serious problem of teenage pregnancy. We have been denied the access to therapeutic abortion after Ortega bought the church during his 2016 presidential campaign. He sold us in exchange for the church’s support. Now, luckily for us, the church has switched sides. They have not changed their minds when it comes to abortion, but they no longer support Ortega. The feminist movement in Nicaragua is clear that social justice must be fought for from multiple angles. Feminism in Nicaragua is alive and well. Feminism in Nicaragua is loud, talks back, thinks a lot and it’s well aware of and intimately engaged with other social movements that seek liberty and equality. JGE: In your novel La mujer habitada—later translated into English by Kathleen N. March and published by Curbstone Press in 2004 as The Inhabited Woman—you include a strong, feminist female character, Lavinia Alarcón. Have you seen many Lavinias fighting in the streets? GB: Yes, there are some Lavinias. But these are other times and these Lavinias are much stronger, and more confident in themselves, and clearer on what they want to do and propose. JGE: Also in The Inhabited Woman you write about the time Sandinistas took over Chema Castillo’s house, in December of 1974, which was also one of the first big actions of the Sandinista movement that was trying to overthrow Somoza. And this was years before the Operación Chanchera, where twenty-five rebels took over Nicaragua’s National Palace, which marked the beginning of the end of Somoza. Do you think Nicaragua today needs another act as bold and risky to defeat Ortega? GB: It’s funny to talk about that now, because the 1974 operation managed to release many political prisoners that were jailed by the Sandinismo, including Ortega. That operation also helped to raise awareness of the ongoing repression in the mountains. Yes, it was risky; it was a risky act and one that required thirteen people thoroughly trained to execute the operation. Therefore, I don’t think we could organize and run a similar operation. Non-violence has been part of the nature of this rebellion. But we now have a different set of opportunities: countrywide discontent, international support, the country’s economic crisis. All that is playing in our favor. JGE: This goes back to the talk we had about hope. GB: I think Ortega is tired. These past few months have weakened him. Right now he’s using this type of Orwellian discourse. He’s saying the protesters are terrorists. He says that the marches are funded by the United States. I think he’s tired. JGE: During the revolution, many artists and intellectuals, like you, Ernesto Cardenal, Claribel Alegría, and Sergio Ramírez coincided. How can art and literature amplify and walk beside a movement such as this one? GB: I think justice is one of art’s primary motivators. And in the case of the revolution, art played a significant role, because the revolution walked hand in hand with poets, musicians, and artists. And these artists were willing to give their voice and work to the revolution. We were able to express our courage and discontent with the written word. The written word also allowed us to plan a future, which, in return, brought importance to the revolution; it made people want to die for that revolution. People learned the poems; they wrote them on walls, they sung the words. Carlos Mejía Godoy, for example, put out a record called Guitarra Armada, in which his lyrics explained how to put together the rifles we used to take away from the guards. Ernesto Cardenal’s poetry was vital as well. People mimeographed the poems and passed them around. Art allowed us to bring awareness to the people and to make them understand that the revolution was just the beginning of a series of actions that would help us create a fairer and more just society. JGE: What role has poetry, and music, and art has played in this year’s protests and social movements? GB: They’re still very relevant. And right now we have video and photography available as well, to document what has been happening. Many people have worked to record everything. Now, anything that Murillo and Ortega argue can be challenged thanks to this material. We didn’t have that in the seventies and eighties. JGE: Recently Claribel, Sergio, and yourself have won important international literary awards. Claribel won the Premio Reina Sofía. Sergio won the Cervantes Prize. You just got the Hermann Kesten Award. Have these awards helped spark conversation in Nicaragua? Maybe bringing awareness to what’s happening? GB: Claribel’s award, just like Sergio’s, was announced before the crisis. Sergio did receive the prize in late April after the protests began, and he dedicated the Cervantes to the young men and women who were killed by the army. The important thing to mention here is that in Nicaragua, the government media did not print a word about their awards. It’s like it didn’t happen. In that sense, there wasn’t a conversation. And it wasn’t until Claribel died, in January, that Rosario Murillo talked about her. Independent media did talk about them and celebrate their work, but Ortega’s silence was evident. JGE: What does the Hermann Kesten award mean to you and your career? GB: I’m very pleased with it since it’s an award meant to highlight freedom of the press and Human Rights. I am currently PEN Nicaragua’s president, and as part of that organization, we have worked thoroughly to ensure freedom of the press, protect journalists and to promote reading. But for me, the most important thing about this award is that it puts Nicaragua under the international spotlight and will help people know what is currently going on in my country. Gioconda Belli is a Nicaraguan poet, writer and political activist. She was involved in the Nicaraguan Revolution from a very young age and occupied important positions in the Sandinista Party and in the revolutionary government. She left the Sandinista Party in 1993. She won the Casa de las Americas Prize in 1978 for her poetry book Line of fire, and the prize for the Best Political Novel of the Year in Germany in 1989 for her novel The Inhabited Woman. Her work has been translated into twenty languages, including three novels into English: The Inhabited Woman, The Scroll of Seduction, and Infinity in the Palm of Her Hand. A book of her poetry, From Eve’s Rib, is also available in English. In Spanish, she has published eight poetry books and eight novels, plus a memoir, a book of essays, and four children’s books. Her poetry has been awarded numerous prizes. Her memoir The Country Under My Skin was a finalist for the Los Angeles Times Book Prize in 2001 and selected as one of the best books of the year by the same newspaper. In 2008, she won one of the most prestigious Spanish prizes, the Biblioteca Breve for her novel, Infinity in the Palm of Her Hand. For this novel, she also received the Sor Juana Ines de la Cruz prize from the Guadalajara Book Fair in Mexico. In 2010, she was awarded the Latin American prize, “La Otra Orilla” for her novel El País de las Mujeres, (Women land). PEN Germany recently awarded her the Hermann Kesten Prize for her defense of freedom of the press and her role as a women’s advocate. 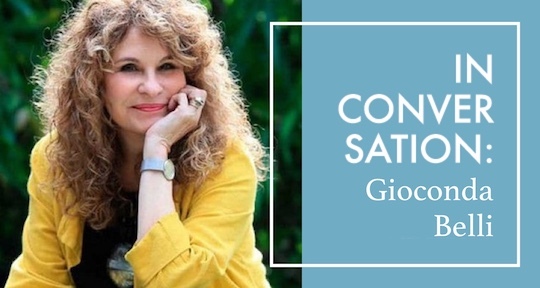 She is President of PEN International, Nicaragua, a member of the Spanish Royal Academy of Letters and Chevalier des les Arts et Letres of France. José García Escobar is a journalist, fiction writer, translator, and former Fulbright scholar from Guatemala. He received his MFA in Creative Writing from The New School in New York City. His writing has appeared in The Evergreen Review, Guernica, and Words Without Borders. He is Asymptote’s Editor-at-Large for the Central American region and currently works as a journalist in Plaza Pública.